The predictions and statistics for this week, the Shell Houston Open (US PGA Tour), are now available on Golf Predictor. It's the final tune-up for the Masters and there's a strong field in Houston, where the course is as usual set up like Augusta. Eight of the top fifteen in the world are teeing it up and it looks like they will have to contend with more difficult conditions as the weather in Texas is promised wet in addition to windy this week. Richie Ramsay (ranked 16th by Golf Predictor) won the Trophee Hassan II on the European PGA Tour. The 31 year old Scot broke out from a packed leaderboard, but had to overcame a treble bogey on the front nine to win his third tour title. Ramsay won by a single shot from Romain Wattel, who just came up short, failing to birdie the difficult final hole to force extra holes. Our top ranked player, Ross Fisher, missed the cut and we had seven of the top seventeen plus ties (7/23). Jimmy Walker (ranked 5th by Golf Predictor) won the Valero Texas Open on the US PGA Tour. The 36 year old American won his fifth tour title at a canter in his home town. Walker lead by four shots overnight and was never in any real danger on the final day, despite a valiant effort by fellow Texan Jordan Spieth on the back nine. Our top ranked player, Jim Furyk, was one of many who struggled in the high winds on Thursday and finished in tied 58th. Overall, we had twelve of the top twenty plus ties (12/25)* in total. The Flot charts handle some formatting situations differently, e.g. if chart data exceeds the maximum/minimum value assigned for the chart. I may have missed some of these issues, so please let me know if you spot a badly formatted chart. Another Flot difference is that horizontal bar charts show the bars are in opposite order to FusionCharts. This is only relevant if you have changed chart orientation in your profile from the default (vertical). Histogram type bar charts (e.g. round score distributions) are only visible in vertical orientation. This was the same with the original charting. As can be seen in the second screenshot above, there is space to right of the Flot pop-up chart. This is to allow for the hover text for the last data point to be visible. Unlike FusionCharts, Flot doesn't handle this very well. Tied positions are now indicated in line chart hover text, where relevant. 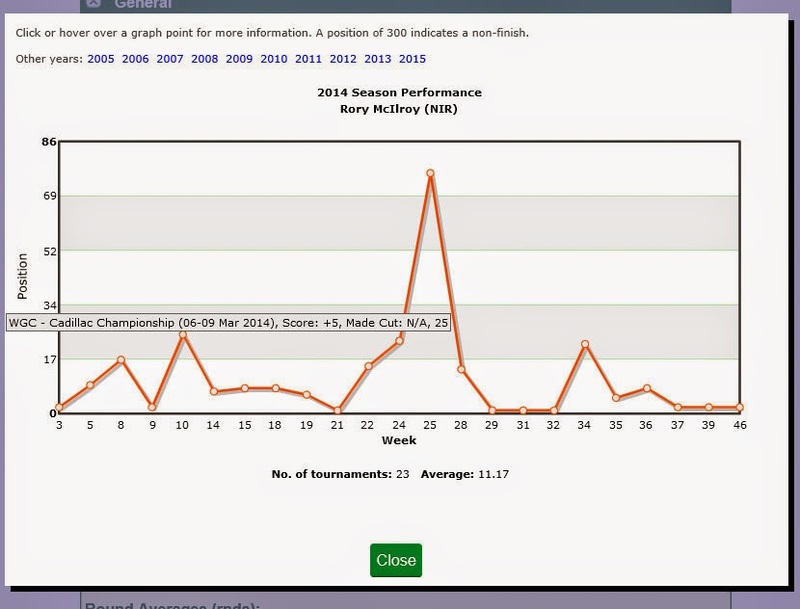 This is shown in the second screenshot above where Rory finished T25th in the WGC - Cadillac Championship. As also shown above, the hover text can also be better formatted in Flot and span multiple lines. Hovering over a slice on a pie chart will show details under the chart, rather than on the slice. Like the existing pie chart, the value will still be shown beside the slice, but you must hover over it to see the percentage of total for the slice below the chart. The values are not shown on/over the bar for vertical (default) bar charts with rotated x-axis labels e.g. golfer comparison charts. These labels have to be rotated for legibility purposes, as the golfer names are too long. However, when the bar value is added, the rotated x-axis labels get misaligned pretty badly. I have therefore hidden the bar value on such charts, but you can hover over a bar to get its value or view it in the vertical orientation to see the bar values in place. The bar values are hidden for the world ranking chart on the tournament page as they were affecting the position/legibility of the axis labels. Sometimes, combinations of Flot plug-ins do not play well together. You can still hover over a bar to get its value. I have tested the charts on FireFox, IE7/8/11 and Chrome on Windows and also iOS and Android. Unlike the Flash based charts they replace, they render on all browser/devices. The charts do render on IE7/8, but they do not look as well or the hover text doesn't work as well as they do on more modern browsers. In any event, if you are using these versions of IE, you should really be thinking about upgrading! I fixed a few long standing errors that were on some of the the existing charts, such as incorrect axis labels. Overall, I believe these new Flot charts are better than the Flash based charts they are replacing. As stated previously, they render quicker, are compatible with all devices, use the latest charting technology and most importantly, the look good. Any feedback (via comments on this article or email) on these new charts would be most welcome. Just another way to make Golf Predictor a little better. I will be converting more charts over the coming weeks to Flot and will post when the next tranche is complete. The predictions and statistics for this week, the Trophee Hassan II (European PGA Tour) and the Valero Texas Open (US PGA Tour) are now available on Golf Predictor. There are only two tournaments left now before Augusta and there are many golfers still desperate for either a golden ticket or some form in advance of the first major of the year. While six of the top fifteen in the world are teeing it up in Texas, in Morocco they have to make do with eleven of the top one hundred in the rankings. Matt Every (ranked 62nd by Golf Predictor) won the Arnold Palmer Invitational pres. by Mastercard on the US PGA Tour. The 31 year old American successfully defended his title after his nearest challengers Henrik Stenson and Morgan Hoffman faltered down the stretch. While Every finished strongly, sinking the winning birdie putt on the last, both Stenson and Hoffman frittered away shots coming down the stretch. Our top ranked player, Rory McIlroy, finished his competitive preparation for Augusta with another lacklustre performance by his own high standards. He still managed to finish tied 11th, despite not hitting anything like top gear. Overall, we had only six of the top seventeen plus ties (6/17) in an event where many of the bigger names failed to perform. The Madeira Islands Open - Portugal - BPI on the European PGA Tour was abandoned due to to inclement weather. The tournament was beset by high winds, heavy rain and thick fog, culminating in the difficult decision to cancel it after flooding made the course unplayable. Talks have started to possibly reschedule it for later in the year, but all scores for the completed first round have been deemed null and void. The predictions and statistics for this week, the Madeira Island Open - Portugal - BPI (European PGA Tour) and the Arnold Palmer Invitational pres. by Mastercard (US PGA Tour), are now available on Golf Predictor. There's a strong field (including the top five in the world) in Orlando as the first major of the season looms larger on the horizon! Alas, there is no Tiger Woods, as the eight time winner of this event is still searching for his game in time for the Masters. As usual, not so strong a field in Madeira, where a whopping 93 golfers are outside the top one thousand in the world rankings. That, plus the promised very bad weather makes this probably the biggest lottery in the seven years of Golf Predictor. George Coetzee (ranked 3rd by Golf Predictor) won the Tshwane Open on the European PGA Tour. The 28 year old South African won his second tour title by a single shot over his fast finishing compatriot Jacques Blaauw. After Blaauw had equalled the course record of 61 (-9) to set a clubhouse target of -13, Coetzee kept his cool on his home course to reel him in down the stretch. Our top ranked player, Ross Fisher, finished in tied 30th and in an event where most of the bigger names (such as they were!) failed to perform, we had only four of the top fifteen plus ties (4/22). Jordan Spieth (ranked 4th by Golf Predictor) won the Valspar Championship on the US PGA Tour. On a high quality final day, the 21 year old American won won his second PGA Tour event in a play-off with Patrick Reed and Sean O'Hair. Spieth took the title on the third extra hole of an exciting play-off with a brilliant twenty eight foot birdie putt. Our top ranked player, Jim Furyk, finished in tied 40th and we had only seven of the top seventeen plus ties (7/23). There appears to be an issue with the charts on Golf Predictor. The latest buggy release of possibly the buggiest technology of all time, Adobe Flash, does not seem to render the charts at the correct size on Windows 8.1. However, the same charts appear to render properly on Windows 7 and Windows XP with the latest version of Flash. In addition, this latest version of Flash appears to crash a lot on Windows 8.1, even by its own low standards! It will render on any modern browser/device, although some older versions of IE may have difficulties (surprise, surprise!). Flash does not work on many mobile devices, most famously Apple devices. It doesn't require the Flash browser plug-in which is a renowned security risk (in addition to crashing a lot!). The charts should render quicker. The charts look very nice, with the possible exception of pie charts, which still look OK. It's free, which is a definite bonus! As I am planning to phase in this new charting technology for the 350 or so charts on Golf Predictor, Windows 8.1 users experiencing the charting issue mentioned above will have to hold on for the new charts. While Flot offers some great options, it may not be possible to reproduce all charts exactly as they are now, e.g. 3D bars/pies are not available. However, for the most part, they will look and behave very similar to the current charts. Replacing all the charts on Golf Predictor is a large undertaking, but you should start to see the new charts appearing over the next few weeks. This roll out will probably start with the golfer prediction page and other data pages (e.g. tournament and player pages), before extended to the view pages (e.g. Prediction Rankings and Season Form pages). I will post again when this roll out commences with a comparison of the old and new charts. On further testing it appears that FireFox and Chrome are affected by this on Flash version 16.0.0.305. Unbelievably, something actually works on IE (IE 11 at any rate) that doesn't work on another major browser! The predictions and statistics for this week, the Tshwane Open (European PGA Tour) and the Valspar Championship (US PGA Tour), are now available on Golf Predictor. As the build up to Augusta continues, seven of the top sixteen in the world rankings are teeing it up in Florida. Meanwhile, the European PGA Tour remains in South Africa, where Ross Fisher and recent winner Andy Sullivan headline the field. Dustin Johnson (ranked 15th by Golf Predictor) won the WGC - Cadillac Championship on the European/US PGA Tour. The 30 year old American won his ninth tour title and capped his comeback from personal issues with a fantastic final day performance. Starting five shots behind J.B. Holmes, Johnson also had to reel in the fast starting Bubba Watson to win the battle of the bombers on the testing long layout. Our top ranked player, Rory McIlroy, finished in tied 9th, despite seemingly not playing well at all. Overall, we had nine of the top seventeen plus ties (9/22). Trevor Fisher Jr (ranked 18th by Golf Predictor) won the Africa Open on the European PGA Tour. The 35 year old became the latest South African to win the event, the first of his career on tour. Fisher did it in style, finishing with 63 and 64 over the weekend to come through the field and win by five shots. Our top ranked player, Andy Sullivan, hadn't got over last week's win and missed the cut. Overall, we had only three of the top eighteen plus ties (3/23) in the event that that a weak field and windy conditions. Alex Cejka (ranked 33rd by Golf Predictor) won the Puerto Rico Open pres. by seepuertorico.com on the US PGA Tour. The 44 year old German/Czech finally won his first tour title in windy Puerto Rico in a five man play-off. Cejka won with a birdie at the first extra hole, defeating Jon Curran, Sam Saunders, Emiliano Grillo and Tim Petrovic. Our top ranked player, Brendon de Jonge, finished in tied 10th and in this usually difficult to predict event, we had seven of the top sixteen plus ties (7/21). The predictions/statistics for this week, the WGC - Cadillac Championship (European/US PGA Tour), the Africa Open (European PGA Tour) and the Puerto Rico Open (US PGA Tour), are now available on Golf Predictor. While almost the big names (including forty nine of the top fifty in the world rankings) will be teeing it up at Trump National Doral, it's the usual second string line up for the other tournaments this week. The Donald will have to make do with only two lowly members of the top one hundred in the world at the second of his courses in use this week! Meanwhile, the European PGA Tour continues its South African swing with the Africa Open and its usual weak field. With only two of the top 100 golfers in the world competing there also, it too promises to be a bit of a lottery! Andy Sullivan (ranked 1st by Golf Predictor) won the Joburg Open on the European PGA Tour. The 28 year old Englishman won his second tournament in as many months in South Africa with a two shot victory over the field. Sullivan got off to a fast start on Sunday and held on while his nearest competitors fell away. Including the winner, we had eight of the top eighteen plus ties (8/23) in this large field event with a relatively poor field. Padraig Harrington (ranked 116th by Golf Predictor) won the Honda Classic on the US PGA Tour. The 43 year old Irishman won his first US title in seven years in a play-off with Daniel Berger. Harrington seemed to be out of contention after dropping three shots early on, but four consecutive birdies on the back nine saw him vault into the lead. However, after a double on seventeen, the Irishman showed his mettle by birdieing the last to force the play-off. After Berger went in the water on the second extra hole, Harrington became the second world number 297 in a row to win on tour. Our top ranked player, Rory McIlroy, missed the cut and in a good week for the bookies, we had a very disappointing three of the top seventeen plus ties (3/21) in the weather affected event. Due to the Monday finish of the weather delayed Honda Classic, the predictions for this week (the WGC - Cadillac Championship (European/US PGA Tour), the Africa Open (European PGA Tour) and the Puerto Rico Open (US PGA Tour)) will be later than normal. The results will inputted into Golf Predictor as soon as possible, but the predictions for this week can not be generated until the latest world rankings arising out of last week's events become available. I will endeavour to produce the predictions as soon as possible, but it is looking like Tuesday evening (Irish time) at the moment before they will be available. I will update this post should the situation change in the meantime and I thank you for your patience. The predictions are now on-line thanks to the earlier than expected availability of the WR stats.